I’ve tried everything to get rid of my acne. After years of using ‘normal’ skincare I ended up going on a course of prescription medication (roaccutane), that worked (eventually after multiple rounds) but majorly thinned my skin, and prescription skincare (ZO Skin Health) that increased my cell turn over so much in the first few months (I’d exfoliate first thing but come midday my face was peeling like a snake shedding its skin), that I was left feeling über self conscious. However, all of those side effects beat enduring the feelings of embarrassment and low confidence I had when my acne was at its peak. Now that I’ve finished my prescription meds and products, I constantly worry that my spots will return (so far it’s only one or two when I get my period), and I’m not alone in this. Neutrogena reports that a whooping 87 per cent of women in Europe say acne has a significant impact on their lives, namely their moods, social interactions and even in the work place (18 per cent believe their acne prevents them from finding a job and performing well in an interview). 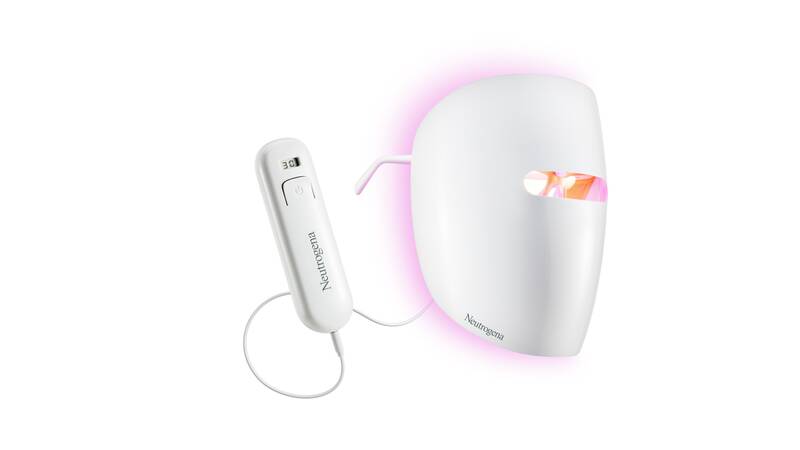 Neutrogena’s answer to this is their LED mask. It’s been out in the UK for about 6 weeks but I didn’t want to write about it till I’d tested it for the full month. It works by emitting blue light to kill acne bacteria (did you know hospitals have been using blue light to ‘clean’ equipment for years!?) and red light to help reduce inflammation and shrink the sebaceous glands that produce oil that can lead to clogged pores. I use it at night post cleanse, before applying my serums and creams, and have found that relaxing for 10 minutes while it’s on is the perfect pre bedtime wind down. It’s important to use the mask daily and to follow an appropriate skincare regime to see the best results, but I’ve yet to have a major breakout so I’m giving this a thumbs up. I’m a creature of habit, and am not too fond of change, so since finding my signature scent a few years back, I’ve rarely worn anything else – until now. I’m obsessed with this delicate, flirty floral fragrance that’s bursting with white blossom notes juxtaposed by tangy lemon and spicy ginger, with a warm sensual sandalwood base. With every hour that passes it evolves, giving each facet of the scent time to shine. It’s beautifully versatile and can be worn day to night, and unlike some scents that simply don’t work in the heat this one comes alive. It turns out that getting your heart broken and crying yourself to sleep most nights is the perfect time to test eye creams, especially ones that claim to de-puff and brighten. I’ve been using the same eye cream for 6 whole years, I love it. However, I’ve never suffered from puffiness before, and personally I felt that my old faithful wasn’t cutting the mustard. So when this soothing cream-gel eye mask landed on my desk I decided this was the perfect time to give it a try. I absolutely love the metal tip applicator as it offers an added cooling effect when massaging the formula into the skin. You’re meant to leave the hydrating hyaluronic acid rich cream-gel on for 3-5 minutes then tissue off any residue or simply massage in what’s left, which is what I do. It can be used as a booster, like you would a face mask or every day (which is how I use it) for peepers in need (like mine). I’m happy to report this has quelled my morning after the night (of crying) before puffiness, and my skin feels firmer and looks brighter to boot. I’ve said it before and I shall say it again, I’m a huge fan of Vitamin C. Not only is it a potent antioxidant that protects the skin from environmental aggressors (that cause premature ageing), it boosts hydration levels and helps to even out skin tone too. I’m on a mission to achieve a more hydrated, even complexion and this serum has really helped. Containing 10 per cent vitamin C, that’s able to pack a pigmentation fading punch without irritating the skin (higher doses can aggravate sensitive skin), and rather clever azelaic acid, that inhibits melanin production to reduce future pigmentation. Plus, a host of peptides (which are proteins – the skin’s building blocks) that protect and strengthen the skin’s barrier (outer most layer) so that it is able to keep the cells below adequately hydrated, and moisturised, as well as prevent chemicals and irritants from entering the skin. Impressive! You’ve heard the science, but what about the texture? Firstly, a little goes a long way. During the first few days of using the light lotion-esque serum it felt a little tacky on my skin, and there was rollage when I applied my foundation a couple of minutes post application. I spoke to Dr Zamani, founder of MZ Skin, about this and turns out I was using too much. So, I made sure I wasn’t over zealous with my daily dosage, and I’m happy to report I’ve had no more issues. London is currently rather humid, and wet! It’s the kind of weather that leaves you feeling uncomfortably hot and sticky, with no idea what to wear or what make-up to apply. My winter foundation (which let’s face it, I’ve pretty much worn throughout spring) just doesn’t work in this humidity. It feels like a heavy film over my skin – namely because it is full coverage – and as soon as my face gets hot, my base begins to look like it may well slide right off. So, I’ve switched to this lighter variety. I use a full coverage concealer only in the areas I need it (yes, I’ve been known to put concealer all over and then top with foundation – sounds mad but looks pretty good at night if you want long-lasting full coverage). Then, I apply the foundation. It’s pretty sheer and feels like a second skin, which is exactly what I’m after when it comes to a summer base. Thanks to its brightening properties and soft focus finish, those with a more even skin tone only need apply one layer, but two will do the trick otherwise. Skin is also cared for as this cushion foundation contains pink silk tree extract and an SPF35 to soothes and protect. Previous Post Dating do’s…6 expert tips for finding the ONE!